Data available in an Excel spreadsheet. Charles Kurzman, “Votes Versus Rights: The Debate That’s Shaping the Outcome of the Arab Spring,” Foreign Policy “Democracy Lab,” February 10, 2012. 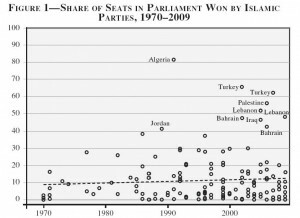 Charles Kurzman and Ijlal Naqvi, Do Muslims Vote Islamic? 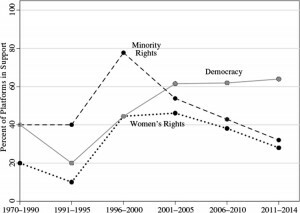 The Journal of Democracy, Vol. 21, No. 2, April 2010, pp. 50-63. Project funded by the United States Institute of Peace, 2007-2008; Henry Luce Foundation, 2013-2014. Methodological details available in a working paper (March 17, 2009). Overview of findings available in The Islamists Are Not Coming, Foreign Policy, January/February 2010. Afghanistan 2005 Hezb-e-Islami (Islamic Party) ? ? Algeria 1997 Harakat al-Nahda al-Islamiyya (Islamic Renaissance Movement) ? ? Algeria 1997 Harakat Mujtama’ al-Silm (Hamas) (Movement for the Society of Peace) ? ? Algeria 2002 Harakat al-Nahda al-Islamiyya (Islamic Renaissance Movement) ? ? Algeria 2002 Harakat al-Islah al-Watani (El-Islah) (Movement for National Reform) ? ? Algeria 2002 Harakat Mujtama’ al-Silm (Hamas) (Movement for the Society of Peace) ? ? Bahrain 1973 Independent Islamists ? ? Bahrain 2002 Independent Islamists ? ? Bahrain 2002 Al-Rabita al-Islamiyya (The Islamic League) ? ? Bahrain 2002 Jam’iyya al-Asala al-Islamiyya (Original Islamic Society) ? ? Bahrain 2002 Jam’iyyat al-Minbar al-Watani al-Islami (National Islamic Tribune Society) ? ? Bahrain 2002 Jam’iyyat al-Wifaq al-Watani al-Islami (National Islamic Reconciliation Society) X X Boycott. Bahrain 2006 Al-Rabita al-Islamiyya (The Islamic League) ? ? Bahrain 2006 al-Shura al-Islamiyya (The Islamic Council) ? ? Bahrain 2006 Jam’iyya al-Asala al-Islamiyya (Original Islamic Society) ? ? Bahrain 2006 Jam’iyyat al-Minbar al-Watani al-Islami (National Islamic Tribune Society) ? ? Bahrain 2006 Jam’iyyat al-Wifaq al-Watani al-Islami (National Islamic Reconciliation Society) ? ? Bahrain 2006 Jam’iyyat al-‘Amal al-Islami (Islamic Action Society) ? ? (draft translation) 2010 Boycotted election. Bahrain 2014 Jam’iyya al-Asala al-Islamiyya (Original Islamic Society) ? ? Bahrain 2018 Jam’iyyat al-Minbar al-Watani al-Islami (National Islamic Tribune Society) ? ? Website. 2014 electoral platform still on website in November 2018. Bangladesh 1986 Jamaat-e-Islami Bangladesh (Islamic Society of Bangladesh) ? ? Bangladesh 1991 Islami Oikkya Jote (Islamic Unity Front) ? ? Bangladesh 1996 Islami Oikkya Jote (Islamic Unity Front) ? ? Bangladesh 2001 Islami Oikkya Jote (Islamic Unity Front) ? ? Bangladesh 2008 Islami Oikkya Jote (Islamic Unity Front) ? ? Bangladesh 2014 Jamaat-e-Islami Bangladesh (Islamic Society of Bangladesh) X X Barred from national elections by Supreme Court in August 2013. Bangladesh 2014 Islami Oikkya Jote (Islamic Unity Front) ? ? Bangladesh 2018 Jamaat-e-Islami Bangladesh (Islamic Society of Bangladesh) X X Boycott. Website. Bangladesh 2018 Islami Oikkya Jote (Islamic Unity Front) ? ? Bangladesh 2018 Islami Andolan Bangladesh (Islamic Movement of Bangladesh) ? ? Website. Comoros 1996 Front National pour la Justice (National Front for Justice) ? ? Egypt 1984 Al-Ikhwan al-Muslimun (Muslim Brotherhood) with Hizb al-Wafd al-Jadid (New Wafd Party) ? ? (draft translation) 2011 Part of the “Al-Thawra Mustimara” (The Revolution Continues) Alliance. Egypt 2015 Hizb al-Banna’ wa al-Tanmiyya (Party of Construction and Development) X X Boycott. Platform on website not changed since 2011. Egypt 2015 Hizb al-Hurriya wa al-‘Adala (Freedom and Justice Party) X X Banned. Prior to ban, affiliated with the Muslim Brotherhood. Egypt 2015 Hizb al-Misr al-Qawiya (Strong Egypt Party) X X Boycott. Facebook page. Egypt 2015 Hizb al-Wasat (Center Party) X X Boycott. Platform on website not changed since 2011. Indonesia 1971 Nahdatul Ulama (Revival of the Ulama) ? ? Indonesia 1971 Partai Muslimin Indonesia (Muslim Party of Indonesia) ? ? Indonesia 1971 Partai Syarikat Islam Indonesia (Indonesia Islamic Union Party) ? ? Indonesia 1971 Perti (Islamic Educators Association) ? ? Indonesia 1977 Partai Persatuan Pembangunan (PPP) (United Development Party) ? ? Indonesia 1982 Partai Persatuan Pembangunan (PPP) (United Development Party) ? ? Indonesia 1987 Partai Persatuan Pembangunan (PPP) (United Development Party) ? ? Indonesia 1992 Partai Persatuan Pembangunan (PPP) (United Development Party) ? ? Indonesia 1997 Partai Persatuan Pembangunan (PPP) (United Development Party) ? ? Indonesia 1999 Partai Bulan Bintang (PBB) (Crescent Star Party) ? ? Indonesia 1999 Partai Kebangkitan Bangsa (PKB) National Awakening Party ? ? Indonesia 1999 Partai Persatuan Pembangunan (PPP) (United Development Party) ? ? Indonesia 2004 Partai Keadilan Sejahtera (PKS) (Prosperous Justice Party) ? ? Indonesia 2004 Partai Persatuan Pembangunan (PPP) (United Development Party) ? ? Indonesia 2004 Partai Bulan Bintang (PBB) (Crescent Star Party) ? ? Indonesia 2004 Partai Kebangkitan Bangsa (PKB) (National Awakening Party) ? ? Indonesia 2004 Partai Bintang Reformasi (PBR) (Reform Star Party) ? ? Indonesia 2004 Partai Persatuan Nahdlatul Ummah Indonesia (NU) (Indonesian Nahdlatul Community Party) ? ? Indonesia 2009 Partai Amanat Nasional (PAN) (National Mandate Party) ? ? Party website has no platform available. (draft translation) 2009 Vision statement rather than a full program. Indonesia 2009 Partai Persatuan Pembangunan (PPP) (United Development Party) ? ? Indonesia 2014 Partai Kebangkitan Bangsa (PKB) (National Awakening Party) 2014 Same platform as 2009. Indonesia 2014 Partai Keadilan Sejahtera (PKS) (Prosperous Justice Party) 2014 Same platform as 2009. Indonesia 2014 Partai Amanat Nasional (PAN) (National Mandate Party) 2014 Brief vision/mission statement. Indonesia 2014 Partai Bulan Bintang (PBB) (Crescent Star Party) 2014 Brief vision/mission statement. Iraq 2005 Jabhat al-Tawafuq al-‘Iraqiyya (Iraqi Accord Front) 2005 December 2005 parliamentary election, not January 2005 transitional assembly election. (draft translation) 2010 Part of Jabhat al-Tawafuq al-Iraqiyya (Iraqi Accord Front), 2010. Iraq 2010 Komele Islami le Kurdistan/Iraq (Islamic Group in Kurdistan/Iraq) ? ? Jordan 2007 Jabhat al-‘Amal al-Islami (Islamic Action Front) 2007 Decided to participate very late in the election cycle. Kuwait 1981 Al-Tajammu’ al-Islami al-Salafi (Salafi Islamic Association) ? ? Kuwait 1981 Al-Ikhwan al-Muslimun (Muslim Brothers) ? ? Kuwait 1985 Al-Tajammu’ al-Islami al-Salafi (Salafi Islamic Association) ? ? Kuwait 1985 Al-Ikhwan al-Muslimun (Muslim Brothers) ? ? Kuwait 1992 Al-Haraka al-Dusturiyya al-Islamiyya (Islamic Constitutional Movement) ? ? Kuwait 1996 Al-Haraka al-Salafiyya (Salafi Movement) ? ? Kuwait 1996 Al-Tajammu’ al-Islami al-Salafi (Salafi Islamic Association) ? ? Kuwait 1996 Al-Ikhwan al-Muslimun (Muslim Brothers) ? ? Kuwait 1999 Al-Haraka al-Salafiyya (Salafi Movement) ? ? Kuwait 1999 Al-Tajammu’ al-Islami al-Salafi (Salafi Islamic Association) ? ? Kuwait 1999 Al-Ikhwan al-Muslimun (Muslim Brothers) ? ? Kuwait 2003 Al-Haraka al-Salafiyya (Salafi Movement) ? ? Kuwait 2006 Al-Haraka al-Salafiyya (Salafi Movement) ? ? Kuwait 2006 Al-Tajammu’ al-Islami al-Salafi (Salafi Islamic Association) ? ? Kuwait 2006 Al-Ikhwan al-Muslimun (Muslim Brothers) ? ? Kuwait 2008 Hizb al-Umma (Umma Party) ? ? Kuwait 2008 Al-Ikhwan al-Muslimun (Muslim Brothers) ? ? Kuwait 2008 Independent Islamists ? ? Kuwait 2009 Al-Haraka al-Dusturiyya al-Islamiyya (Islamic Constitutional Movement) ? ? Kuwait 2009 Al-Tajammu’ al-Islami al-Salafi (Salafi Islamic Association) ? ? Kuwait 2009 Independent Sunni Islamists ? ? Kuwait 2012 (February) Al-Tajammu’ al-Islami al-Salafi (Salafi Islamic Association) ? ? Kuwait 2013 Al-Tajammu’ al-Islami al-Salafi (Salafi Islamic Association) ? ? Kuwait 2013 Hizb al-Umma (Umma Party) ? ? Lebanon 1992 al-Jama’a al-Islamiyya (The Islamic Society) ? ? Lebanon 1992 Jami’at al-Mashari’ al-Khayriyya al-Islamiyya (The Association of Islamic Charitable Projects) ? ? Lebanon 1996 al-Jama’a al-Islamiyya (The Islamic Society) ? ? Lebanon 1996 Jami’at al-Mashari’ al-Khayriyya al-Islamiyya (The Association of Islamic Charitable Projects) ? ? Lebanon 2000 al-Jama’a al-Islamiyya (The Islamic Society) ? ? Lebanon 2009 al-Jama’a al-Islamiyya (The Islamic Society) ? ? (draft translation of video) ? Webpage for platform is blank. Short video describes the platform. Malaysia 1974 Parti Islam Se-Malaysia (PAS) (Islamic Party of Malaysia), as part of the Barisan Nasional (National Front) ? ? PAS was part of the National Front for the 1974 election. Malaysia 1982 Parti Islam Se-Malaysia (PAS) (Islamic Party of Malaysia) ? ? Malaysia 1986 Parti Islam Se-Malaysia (PAS) (Islamic Party of Malaysia) ? ? Malaysia 1990 Parti Islam Se-Malaysia (PAS) (Islamic Party of Malaysia) ? ? Malaysia 1995 Parti Islam Se-Malaysia (PAS) (Islamic Party of Malaysia) ? ? Malaysia 2013 Parti Islam Se-Malaysia (PAS) (Islamic Party of Malaysia) ? ? PAS was part of the Pakatan Rakyat (People’s Alliance), which issued a manifesto in Bahasa Malaysia and English. Malaysia 2018 Parti Islam Se-Malaysia (PAS) (Islamic Party of Malaysia) 2018 PAS was the leading party in the Malaysia Sejahtera (Prosperous Malaysia) coalition. Malaysia 2018 Parti Amanah Negara (AMANAH) (National Trust Party) ? ? Mission and vision statements. AMANAH was part of the Pakatan Harapan (Alliance of Hope), which issued a joint manifesto. Maldives 2009 Adhaalath Paatee (Justice Party) ? ? Morocco 2007 Hizb al-Nahda wa’l-Fadila (Party of Renaissance and Virtue) ? ? Morocco 2016 Hizb al-Nahda wa’l-Fadila (Party of Renaissance and Virtue) ? ? Pakistan 1970 Jamiat-e-Ulema-i-Islam (Society of Religious Scholars of Islam) ? ? Pakistan 1970 Jamaat-e-Ulema-e-Islam (Society of Religious Scholars of Islam) / Jamaat-e-Ahl-e-Hadith (Society of the Family of Hadith) ? ? Pakistan 1970 Markazi Jamiat-e-Ulema-e-Pakistan (Central Society of Religious Scholars of Pakistan) ? ? Pakistan 1988 Jamiat-e-Ulema-i-Islam (JUI) (Society of Religious Scholars of Islam) ? ? Pakistan 1988 Jamaat-e-Ulema-e-Islam Fazl (JUI-F) (Society of Religious Scholars of Islam, Fazl Group) ? ? Pakistan 1990 Jamiat-e-Ulema-i-Islam (JUI) (Society of Religious Scholars of Islam) ? ? Pakistan 1993 Islamic Jamhoori Mahaz (Islamic Democratic Front) ? ? Pakistan 1993 Mutahida Deeni Mahaz (United Religious Front) ? ? Pakistan 1997 Jamaat-e-Ulema-e-Islam Fazl (JUI-F) (Society of Religious Scholars of Islam, Fazl Group) ? ? Pakistan 2008 Jamaat-e-Ulema-e-Islam Fazl (JUI-F) (Society of Religious Scholars of Islam, Fazl Group) ? ? Pakistan 2013 Islami Nazaryati Tehreek Pakistan (Islamic Movement of Pakistan) 2013 (summary) 2013 Booklet and constitution also available on same page. Pakistan 2013 Jamiat Ulama-e-Pakistan (Niazi) ? ? Pakistan 2018 Jamiat Ulema-i-Islam Sami (Society of Religious Scholars of Islam, Sami-ul-Haq Group) ? ? Somalia 2016 Xisbiga Nabadda Iyo Horumarka (Peace and Development Party, PDP) Same as 2011 platform? Sudan 1968 Hizb al-Umma, Janub (Nation Party, South) ? ? Sudan 1968 Hizb al-Umma, Imam (Nation Party, Imam) ? ? Sudan 1986 Al-Jabha al-Islamiyya al-Qaumiyya (National Islamic Front) ? ? Tajikistan 2000 Hizbi Nahzati Islomi Tojikiston (Party of the Islamic Front of Tajikistan, also known as Islamic Renaissance Party) ? ? Tajikistan 2005 Hizbi Nahzati Islomi Tojikiston (Party of the Islamic Front of Tajikistan, also known as Islamic Renaissance Party) 2005 This program is only a summary. Tajikistan 2010 Hizbi Nahzati Islomi Tojikiston (Party of the Islamic Front of Tajikistan, also known as Islamic Renaissance Party) ? ? See list of candidates here. Tunisia 1989 Hizb an-Nahda (Renaissance Party) ? ? Tunisia 2011 Hizb al-Umma al-Tunisi (Tunisian Nation Party) (PTN) ? ? Tunisia 2011 Hizb al-Wahda wa al-Islah (Party of Unity and Reform) (PUR) ? ? Turkey 1977 Milli Selâmet Partisi (National Salvation Party) ? ? 1. Does the party call for a violent revolution against the state? 2. Does the party support democracy? Do they define democracy? 3. Does the party require the implementation of the sharia? What is their definition of the sharia? Who will adjudicate disputes over the meaning of the sharia? 4. What are the top three issues in the party platform? 5. Where does the party stand on women’s rights and the implementation of Islamic family law? 6. How does the party propose to treat minorities? 7. Does the party platform propose any welfare programs such as pensions, poverty relief, and medical care for those in need? 8. Is jihad mentioned? In what context? How is jihad defined? 9. What is the party’s position on the Israel/Palestine conflict? 10. Does the party mention an anti-corruption stance in its platform? 11. Does the party platform propose banning interest based banking? 12. Is the party platform accepting of a free market economy? 13. Is the party platform encouraging towards foreign investment?